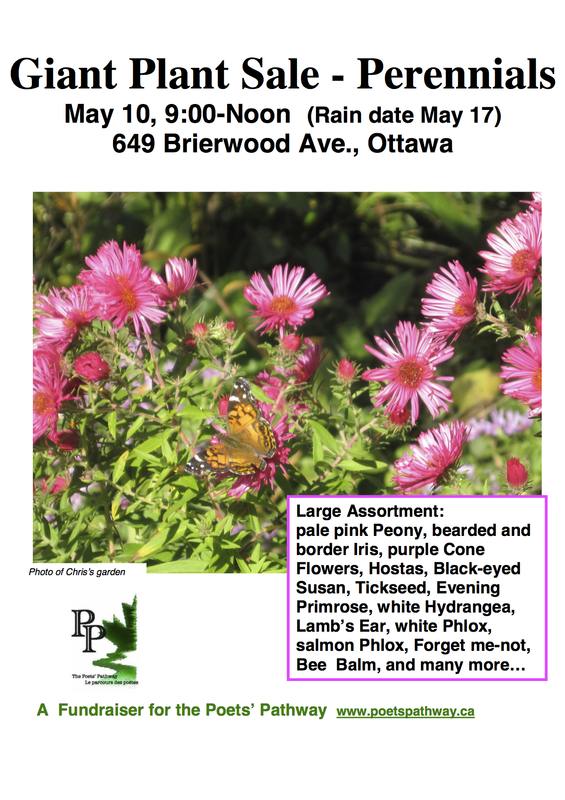 For those of you looking for perennials to fill in your gardens, don’t forget the AVCA Perennial exchange tomorrow (at Billings Estate) and another one today held as a fundraiser for the PoetsPathway.ca. Sale is held at the Billings Estate National Historic site on Cabot (off Pleasant Park near the Transitway station). 10:30-11am: Gardeners arrive with plants to exchange. Please put plants in pots or containers, and label them with masking tape or by writing on Popsicle sticks, etc. Plants are placed in the “shade” area or the “sun” area on site. 11am-12 noon: The exchange part of the day takes place. Gardeners are welcome to swap plants and ask questions of each other. This is run very informally and all participants are asked to be fair about the number and types of plants they bring and take away. Sometimes arrangements are made to visit each others’ gardens when plants will be ready to split and/or transplant. 12 noon-1pm: Any remaining plants are sold ($3 for small pots/$5 for large pots) with the proceeds going to the Alta vista Community Association (AVCA).